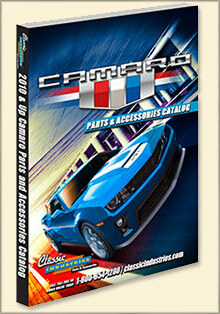 With hundreds of ways to get quicker acceleration, better stopping power, more responsive handling, and virtually limitless options for customization inside and out, the new Classic Industries Gen 5 Camaro parts catalog has the most comprehensive source for 2010-13 Camaro products. Enter the Promo Code - C735G - at checkout on the Gen5 Camaro from Classic Industries website. Power - Superchargers, GM Performance engines, tuners, cold air intakes, throttle body spacers, radiators, shifters, clutch components, tuning modifications, exhaust systems and more! Performance - Suspension packages, control arms, sub frame connectors, coil springs, shocks, sway bars, strut braces, brake packages, performance rotors, brake pads, stainless brake lines, brake tools and more! Style - Allow the Gen 5 Camaro Parts catalog to help you customize your vehicle to achieve the ultimate styling. You'll find body lighting, body kits, GM replacement parts, ground effects, spoilers, wings, scoops, valance panels, grills, bow tie emblems, Transformers emblems, retro style emblems, rally stripes, custom decals and more! Accessories - Accessorize your ride with premium door panels, floor mats, performance seats, interior trim, performance gauges, steering wheels and more! The New Gen 5 Camaro Parts Catalog from Classic Industries maintains a massive inventory of products for your 5th generation Camaro, making them one of the largest and most trusted providers of restoration and performance parts in the country.